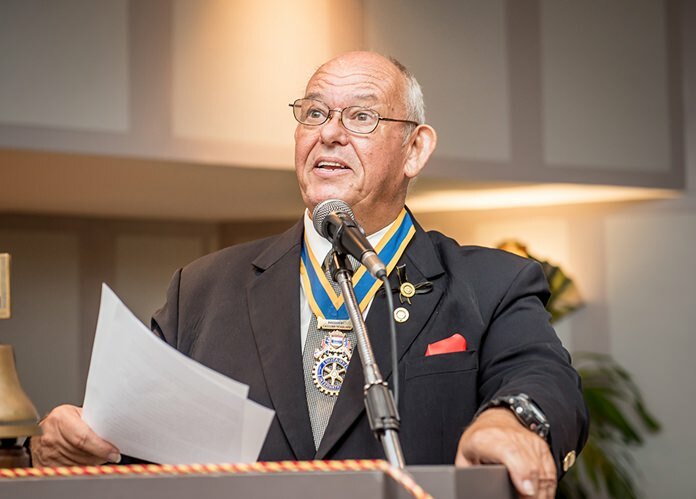 PP Jan Abbink emcees the installation ceremonies. 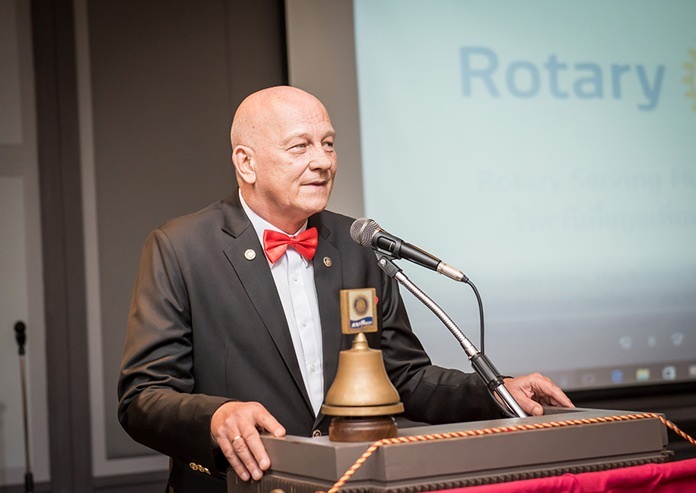 The Rotary Club of the Eastern Seaboard installed Brian John Songhurst as its president for the 2017-18 year. 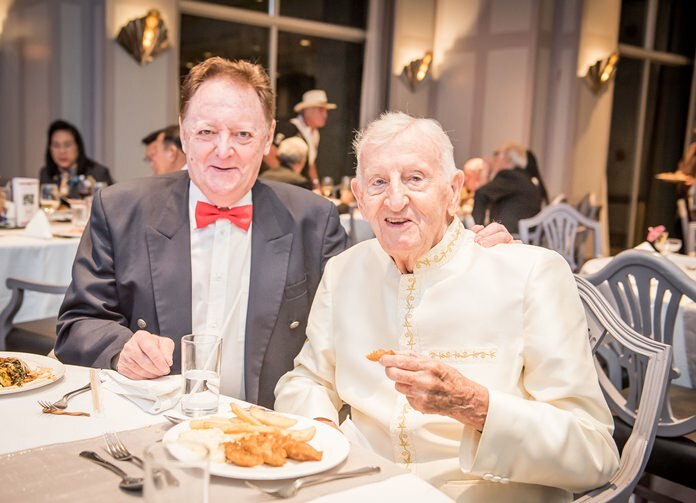 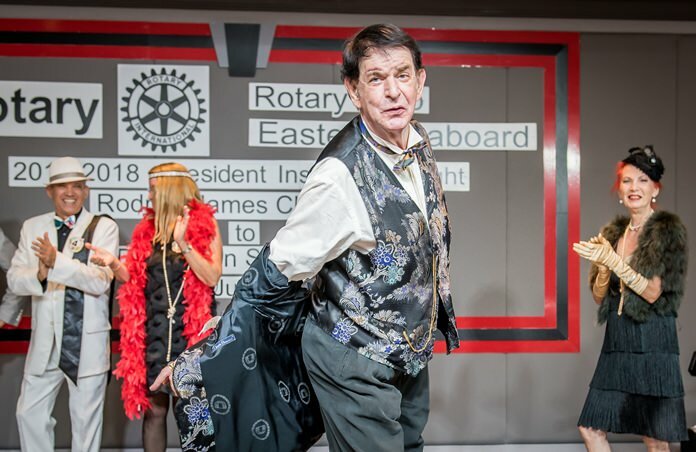 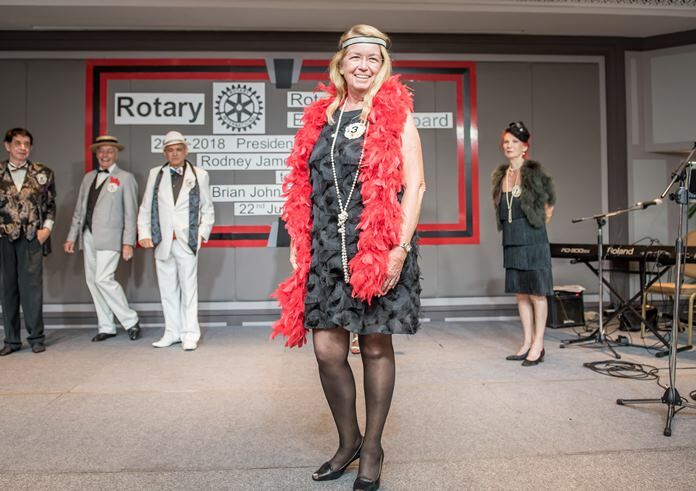 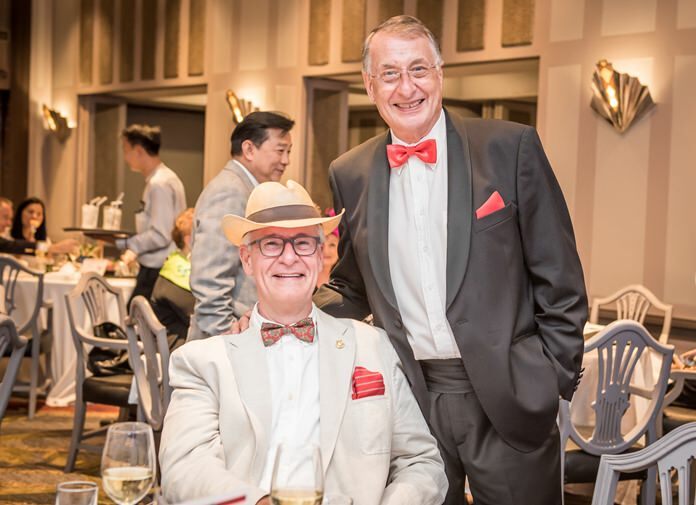 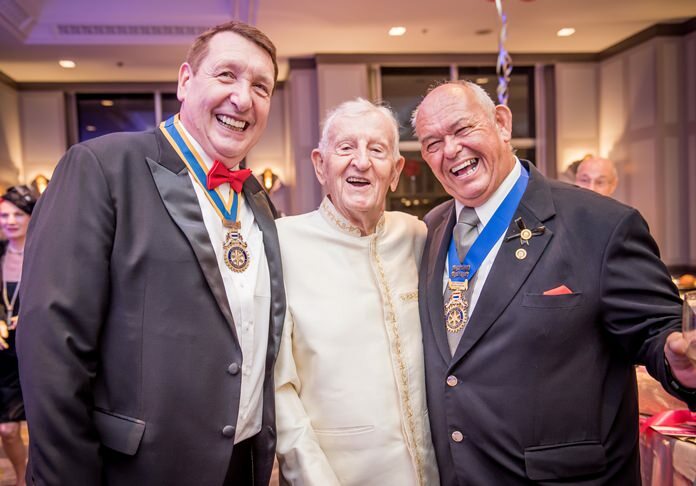 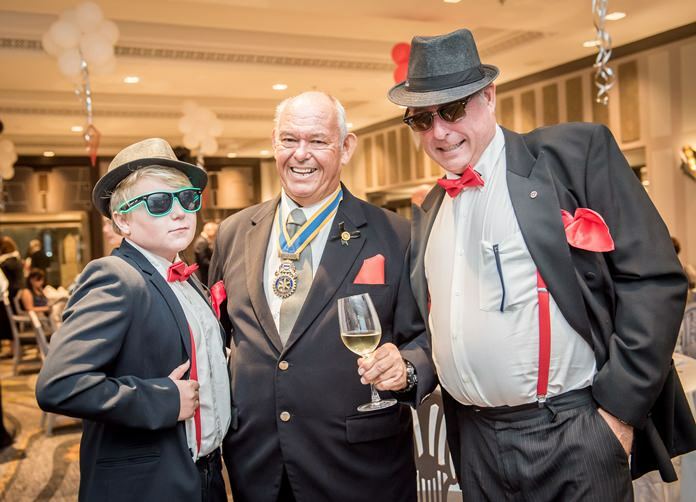 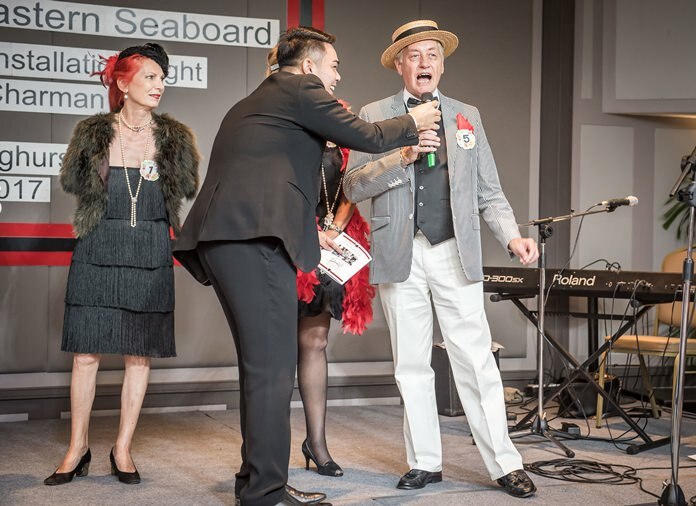 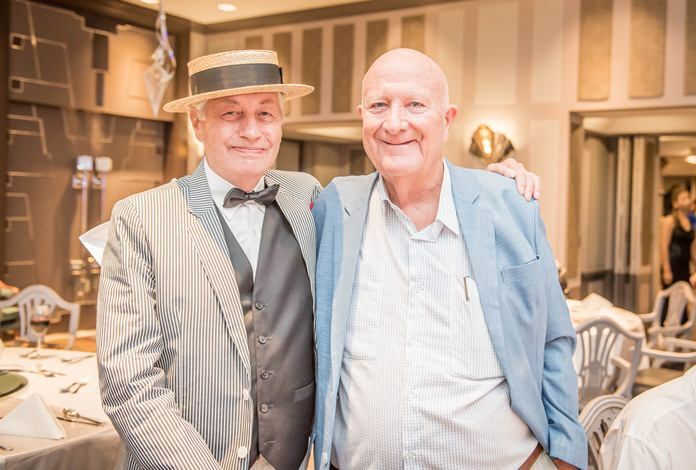 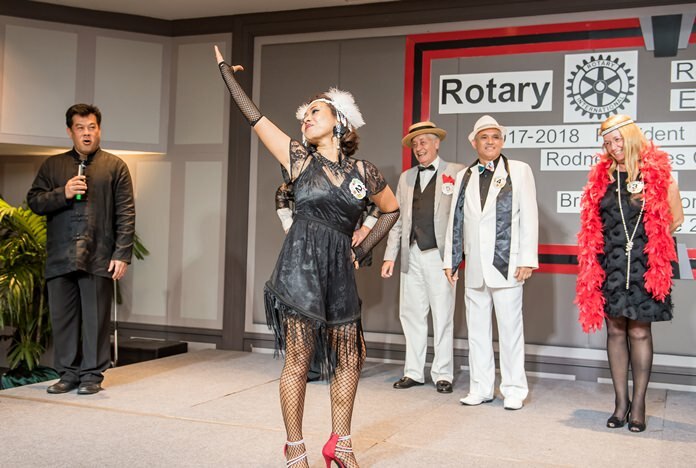 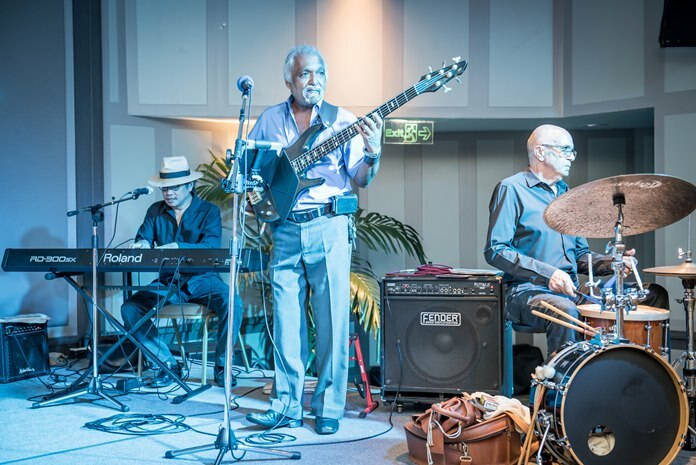 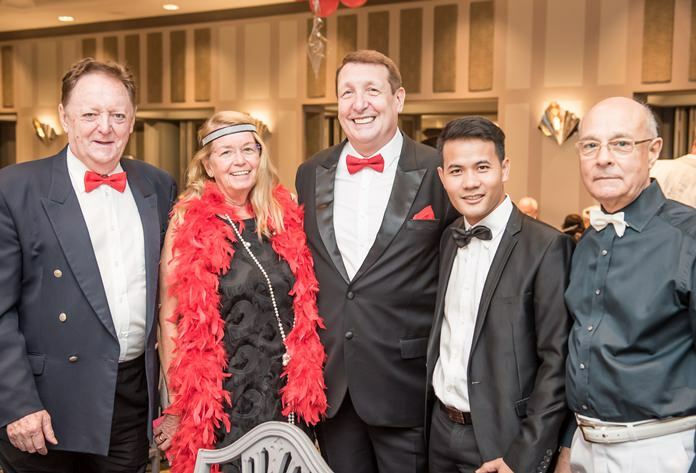 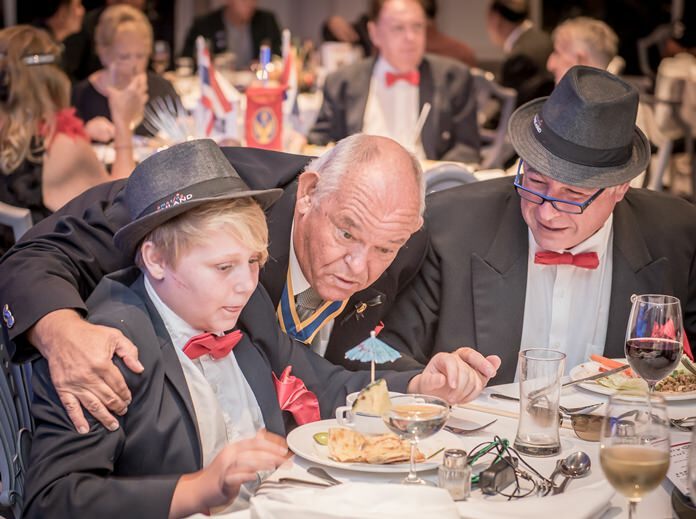 Rotarians thanked outgoing president Rodney James Charman for his service at the June 22 gala at the Siam Bayshore Resort, which this year carried a Roaring 20s Jazz theme. 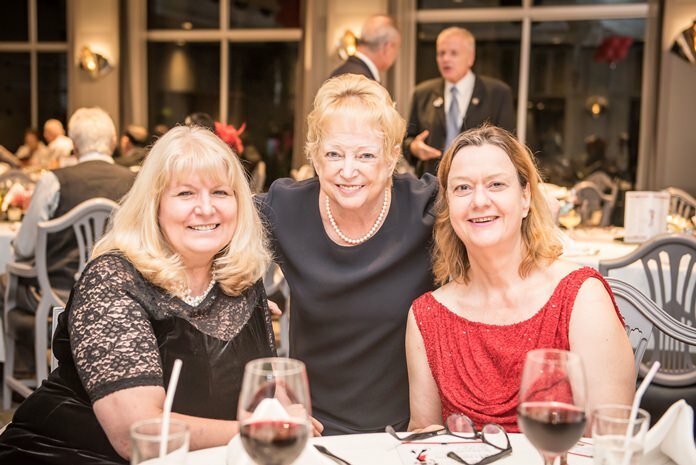 More than 100 guests dressed in “black and white with a touch of crimson” settled in after drinks to hear past president and emcee Jan Abbink begin the festivities by outlining achievements and goals. 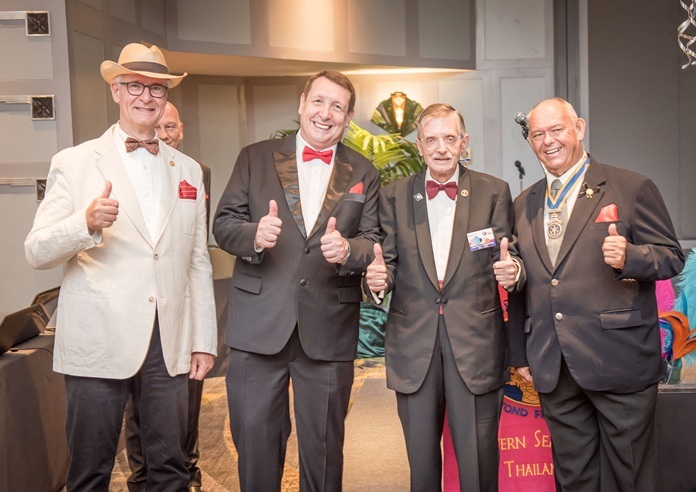 After dinner, Charman gave his farewell remarks before Abbink surprised him with the presentation of a Paul Harris Pin plus one sapphire. 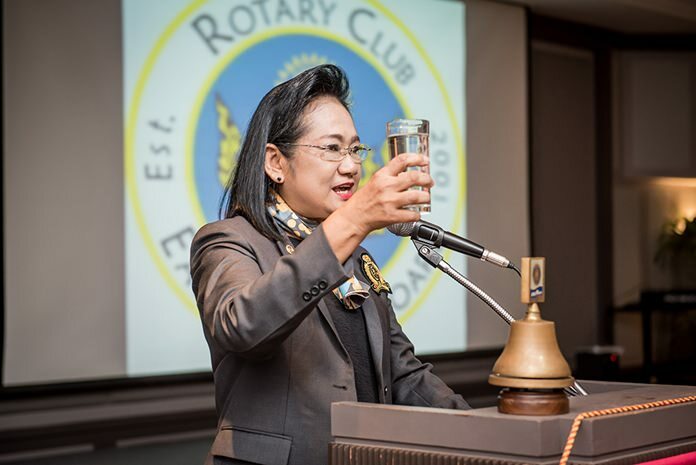 DGE Onanong Sirpornmanut proposes a toast to Rotary International. 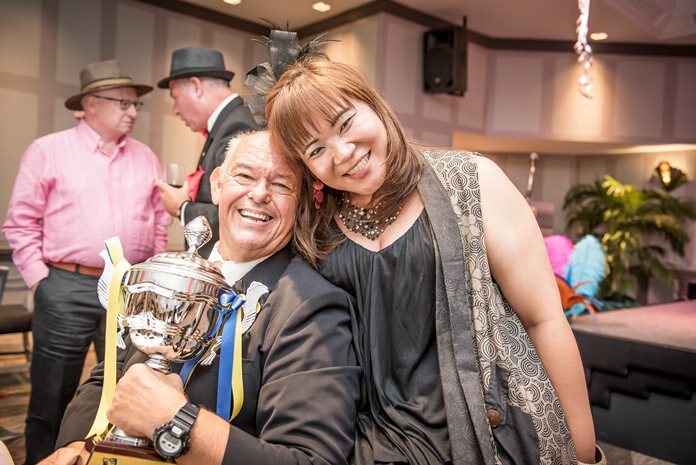 “I must say it has gone fast and I have enjoyed it all,” Charman said. 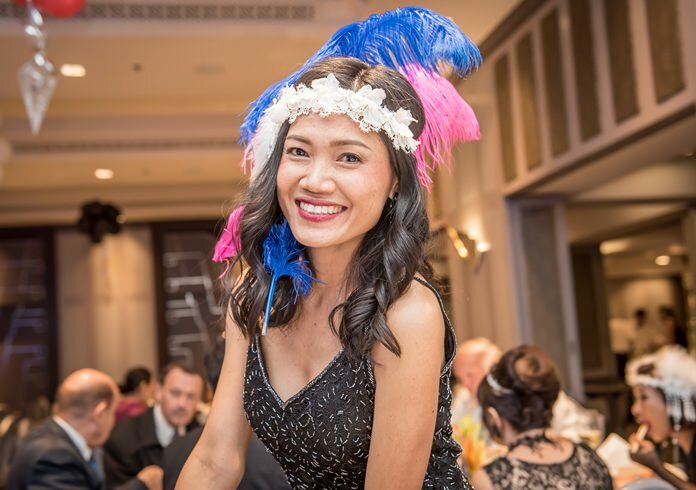 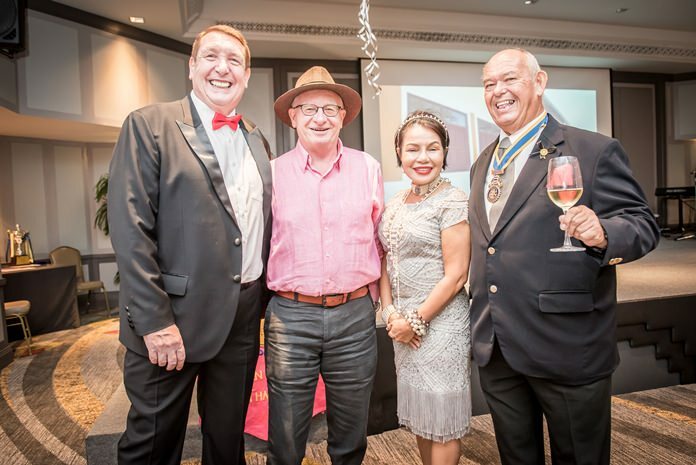 “I have traveled all over Thailand and into Laos where I have met many lovely people, seen hundreds of children’s smiling faces, a lot of humbleness, gratefulness and love. 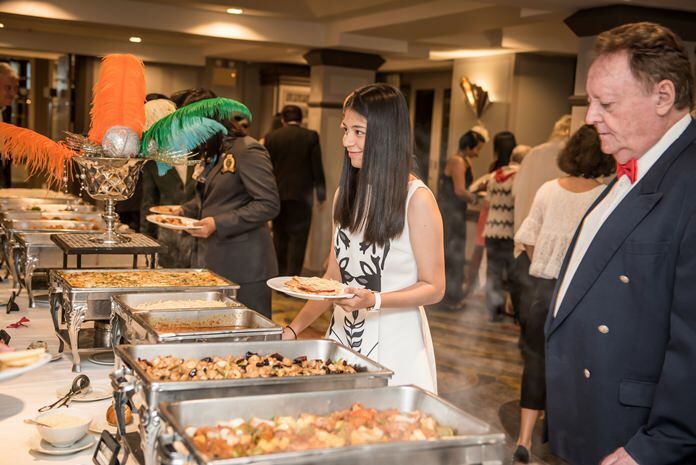 Most of this is for a glass of clean water, a Christmas bag of goodies, a new school, an education center, a parcel of food, and so on. 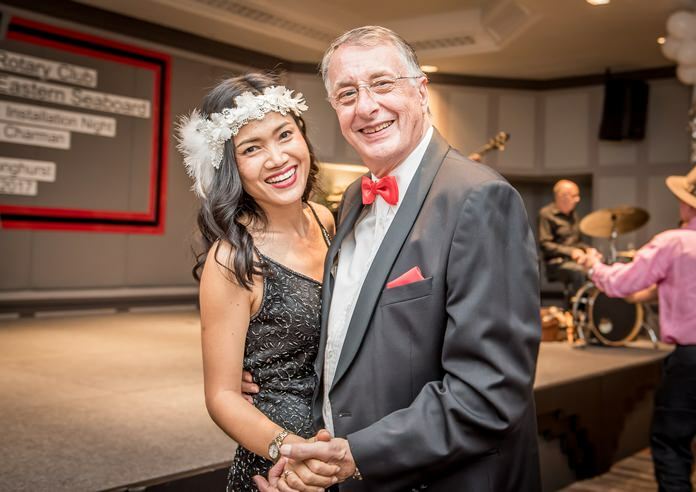 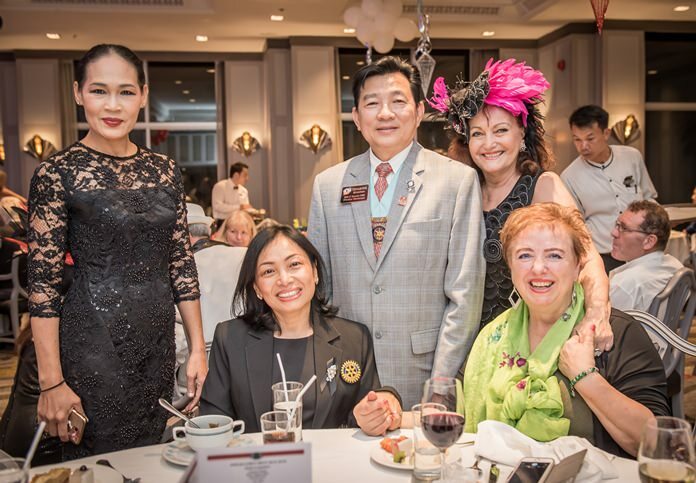 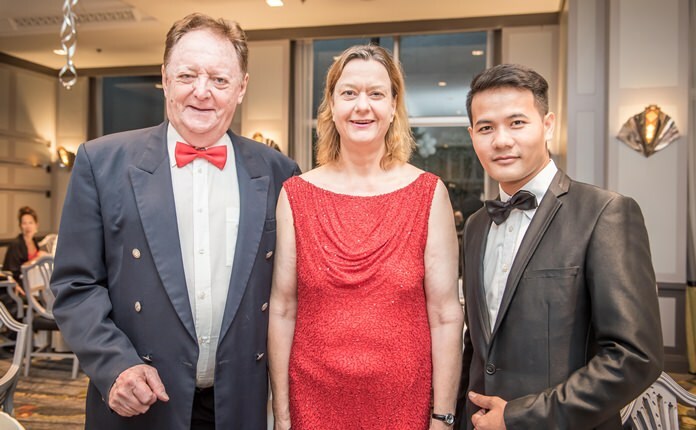 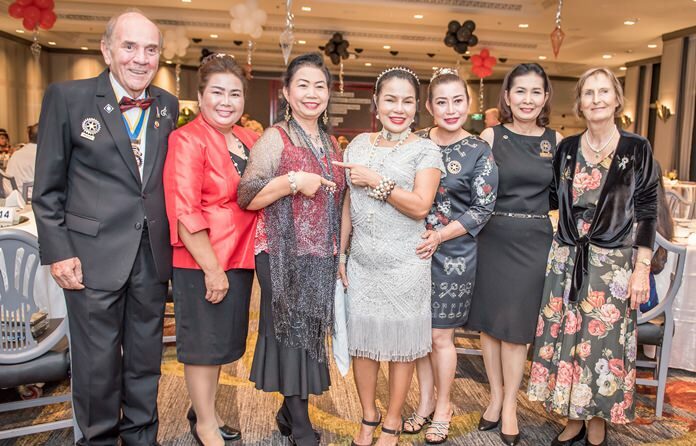 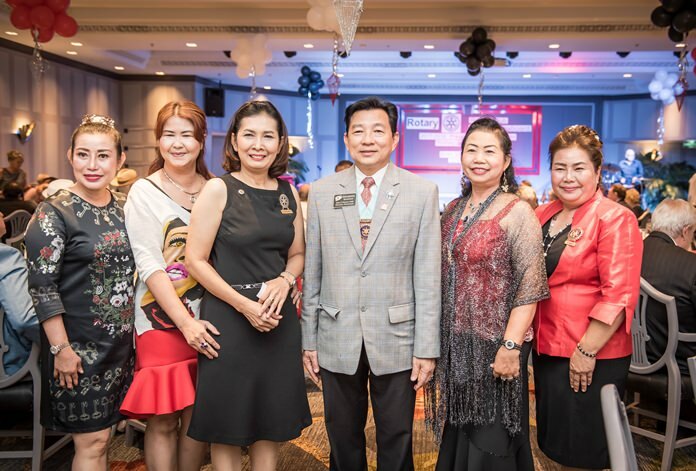 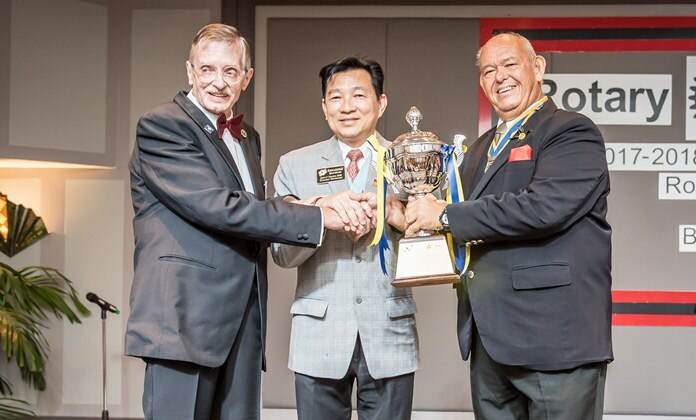 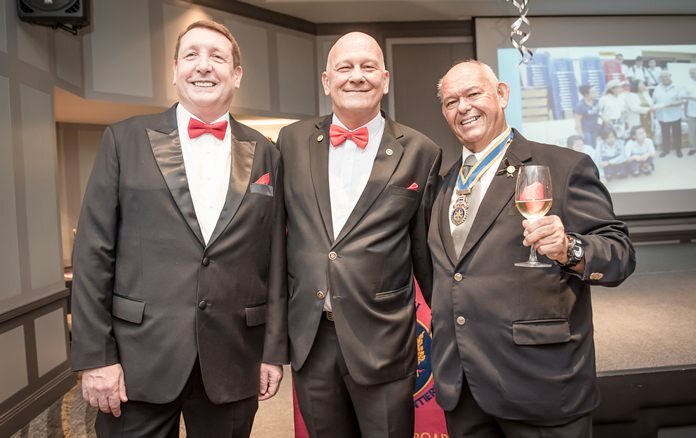 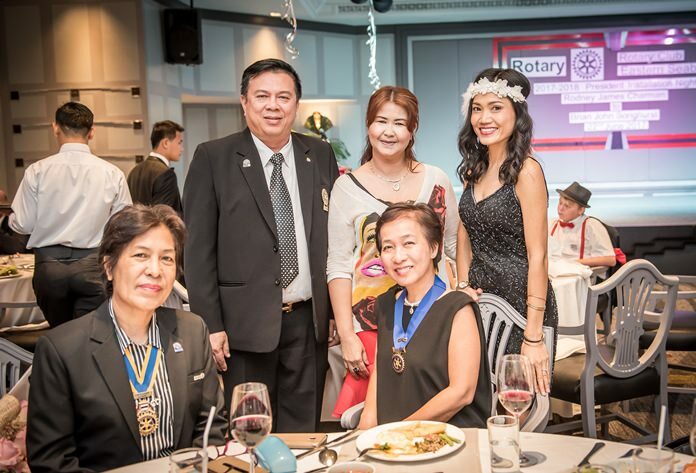 He singled out Otmar and Margret Deter, the outgoing and incoming presidents of the Rotary E-Club Dolphin Pattaya International, as well as charter president Martin Brands. 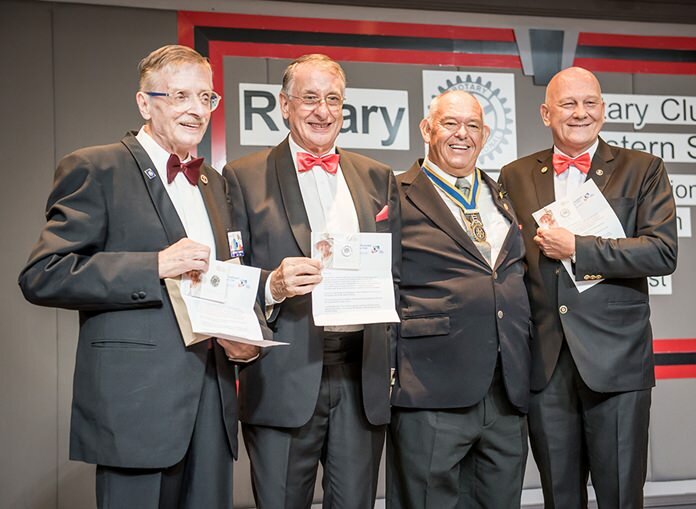 In his last act as president, Charman said he would present to his board and committee chairs a Queen Sapphire Jubilee 2017 £5 coin. 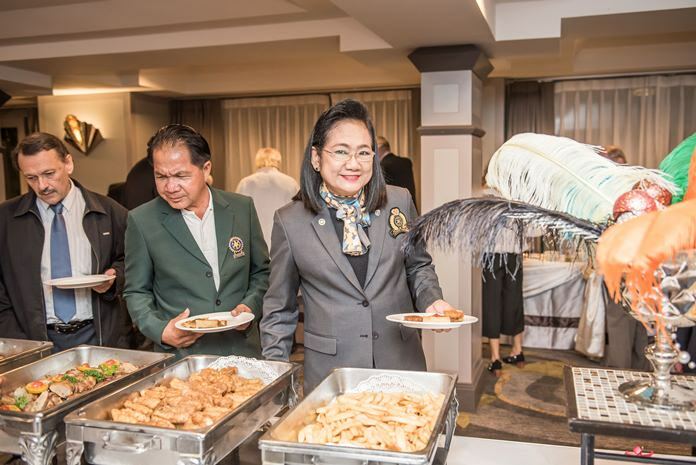 The same gift would be given to the Dieters while Abbink and his wife Ket, Brands and Carl Dyson would receive Queen’s 90th Birthday £20 limited coins from the U.K. Royal Mint. 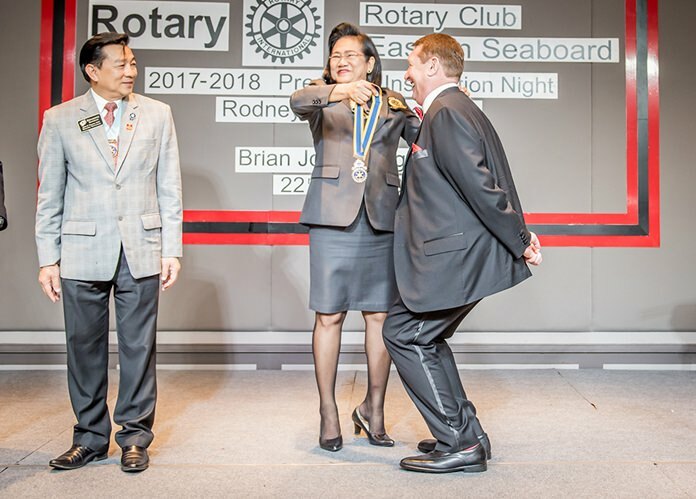 Finally, Songhurst was called to the stage where District 3340 Governor Elect Onanong Sirpornmanut presented him a certificated for completing his presidential training and installed him as president of the club. 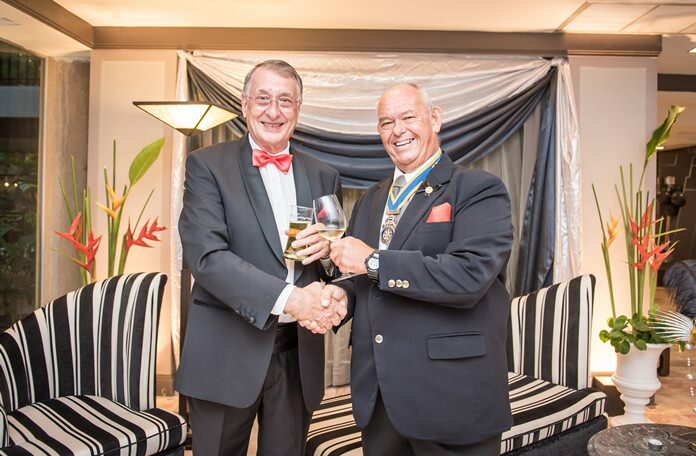 Outgoing president Rodney James Charman makes his farewell speech. 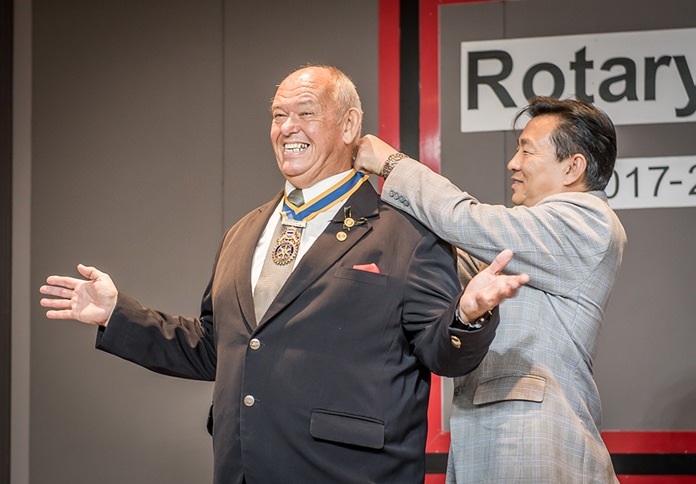 He called Charman a “tough act to follow” and said, during his term, he’d like to improve relationships with other Rotary clubs. 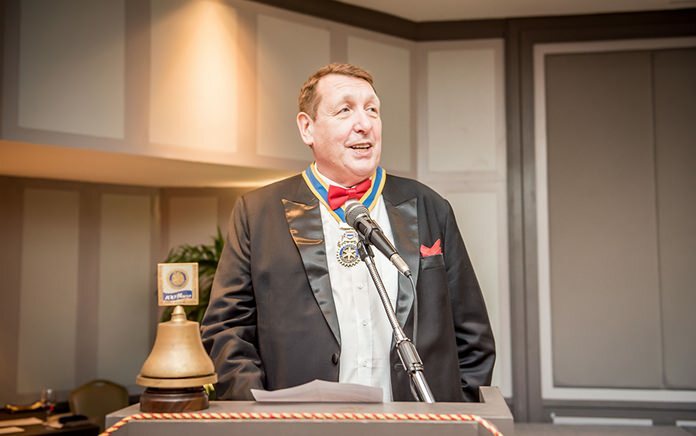 Brian John Songhurst delivers a speech on his plans and objectives for the coming year. 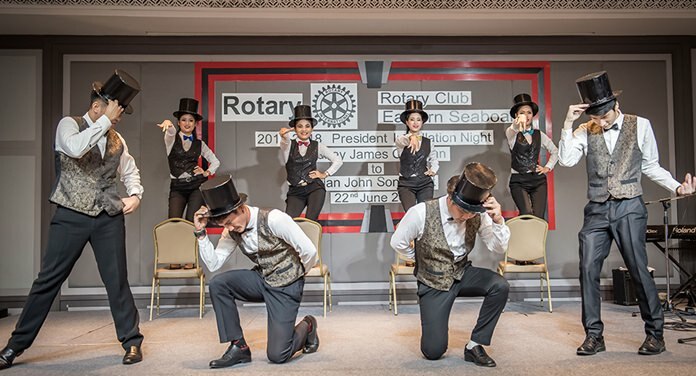 Ceremonies concluded, the Rotarians finished their night with entertainment by the Smoove Groove, a “Jazz Hot” show and “Mr. 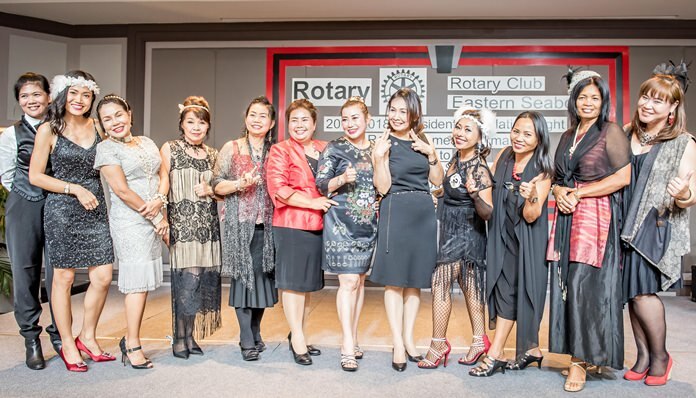 & Mrs. Rotary” competition. 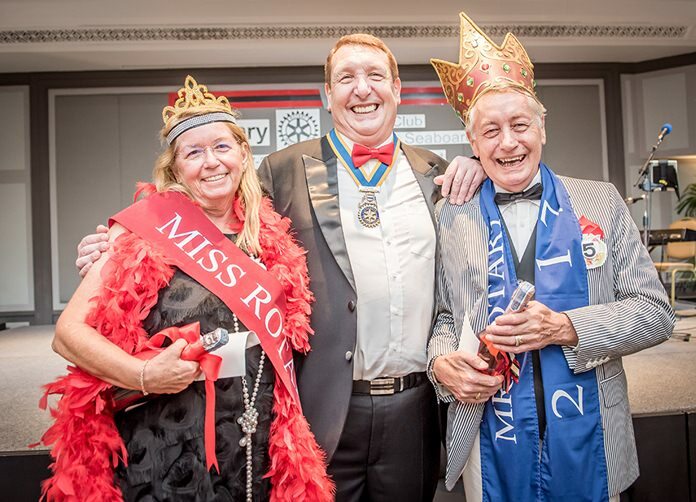 Prizes were drawn for the best-dressed guests, with the winners being Veronique Waas and Peter Barnwell. 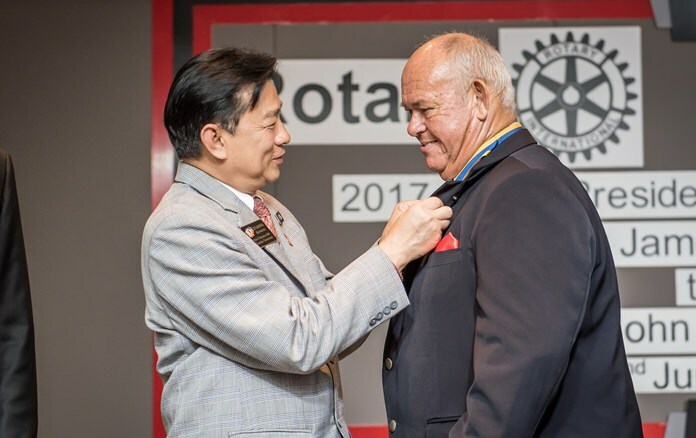 DG Eknarong Kongpan removes the president’s chain from Charman’s neck. 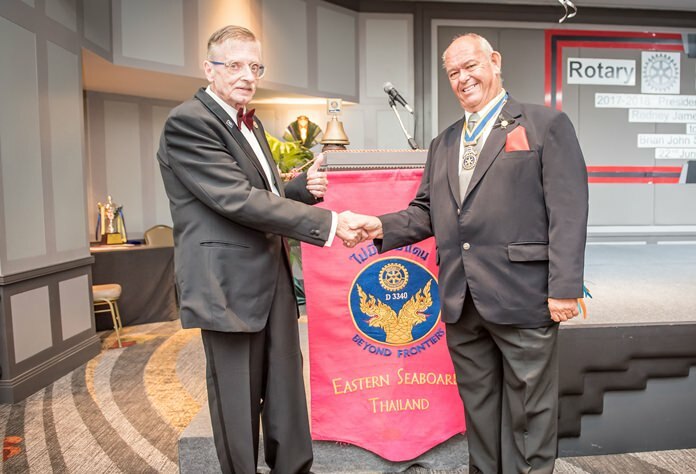 DGE Onanong installs Brian John Songhurst as president for 2017-18. 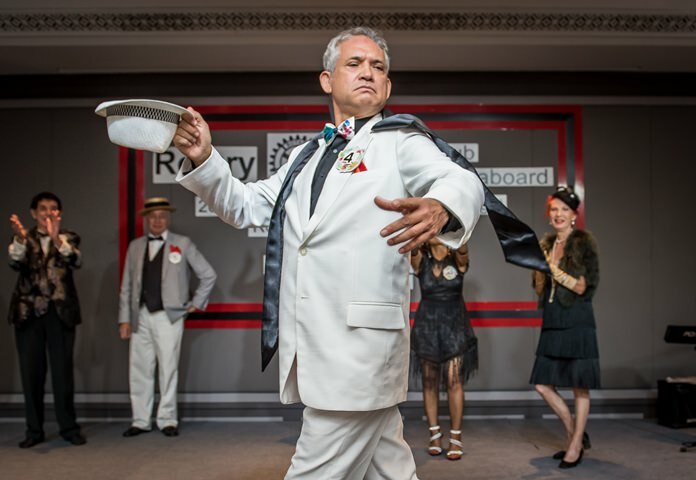 Rodney presented a special gift to his board of directors. 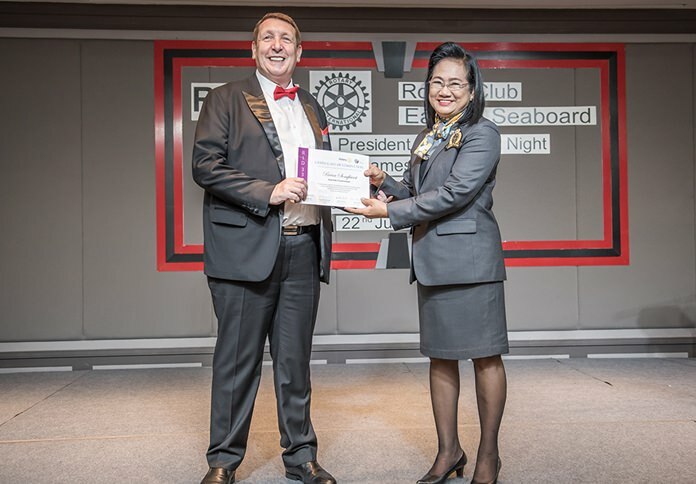 DGE Onanong Sirpornmanut presents PE Brian John Songhurst with a certificate. 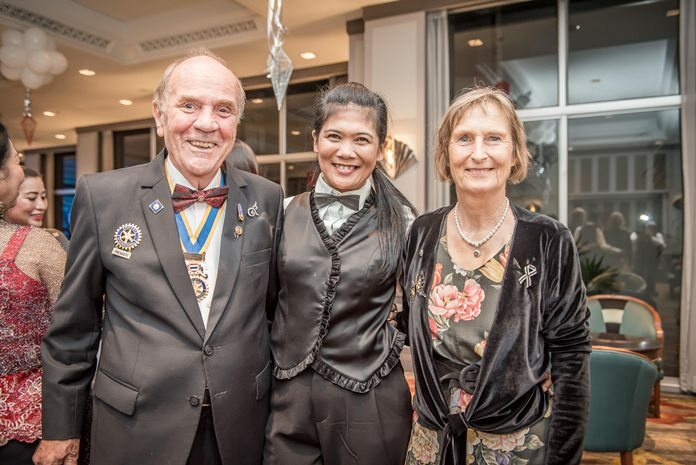 Miss Rotary Veronique Waas and Mr. Rotary Peter Barnwell pose for a photo with President Brian John Songhurst. 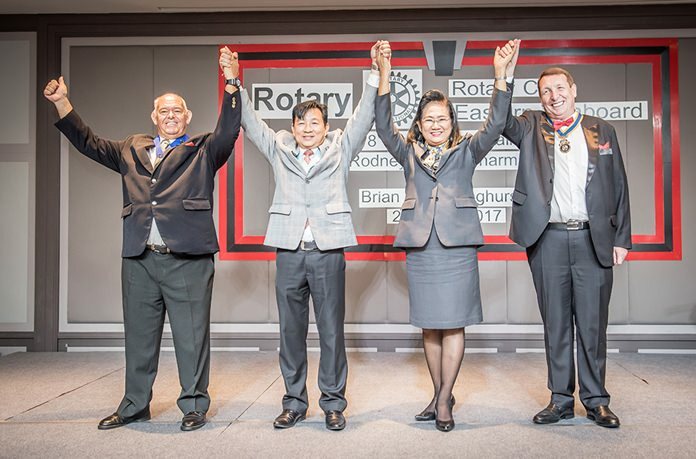 PP Rodney James Charman, DG Eknarong Kongpan, DGE Onanong Sirpornmanut and President Brian John Songhurst. 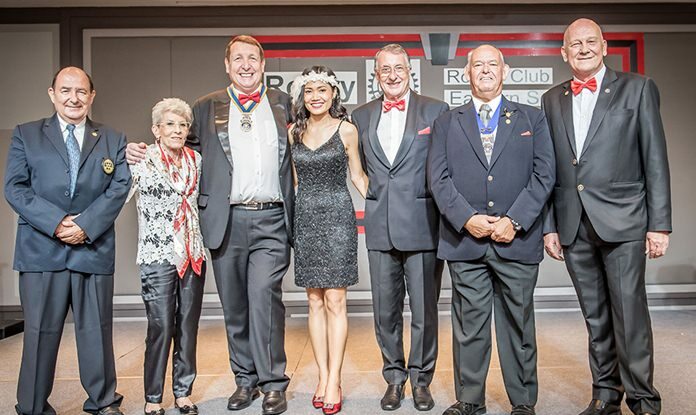 President Brian John Songhurst with his board of Directors, (l-r) Hans Peter Graf, Marianne Biel, Joy and Carl Dyson, Pres. 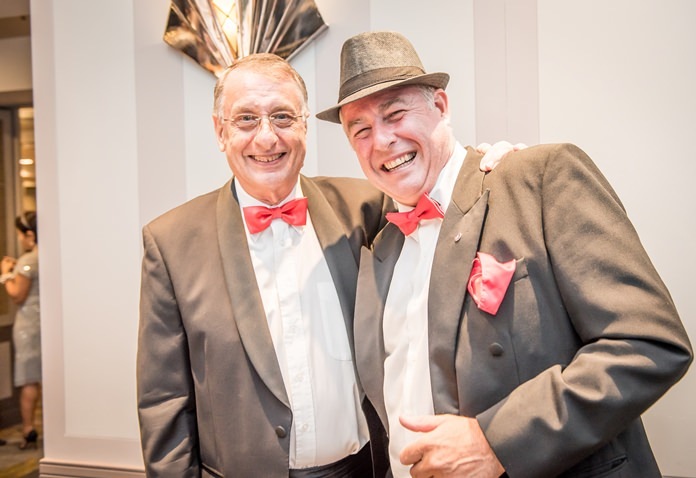 Rodney Charman and PP Jan Abbink. 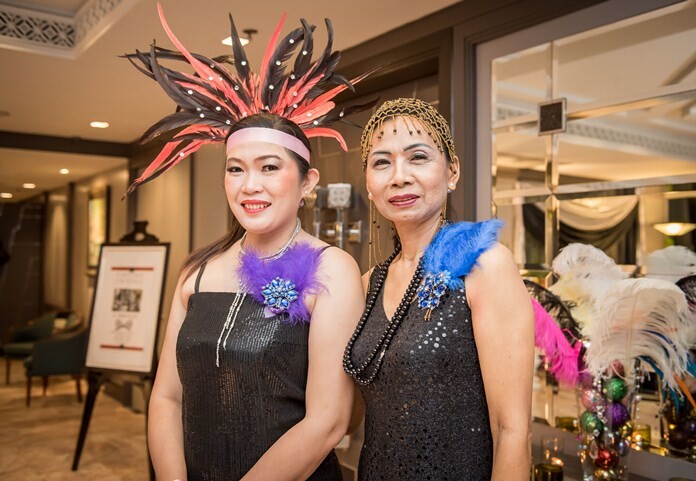 The Jazz Hot show, performed by employees of Siam Bayshore.